Barclays said it would "play a pivotal role" in its "long-term strategic priorities". The offer requires that at least 42% of the new jobs are of "high value", with at least 341 posts made available for disadvantaged workers or those who have a disability. Paul Compton, chief operating officer at Barclays, said: "The Glasgow campus, alongside others in Whippany, New Jersey, and Pune, India, is part of a global strategy to create world-class facilities for our functions, technology and operations teams. "This new campus at Buchanan Wharf is a flagship project for the bank, which builds on Barclays' long history in Scotland and clearly demonstrates our commitment to supporting the UK economy." Scotland's first minister, Nicola Sturgeon, said the project would be "transformational for Glasgow". "This is fantastic news for Glasgow. This is the kind of investment that will create lots of jobs ... but it is also the kind of investment that will be transformational for this part of the city. "It is likely to act as a magnet for other investment that will see the regeneration of a part of Glasgow that has long needed it." 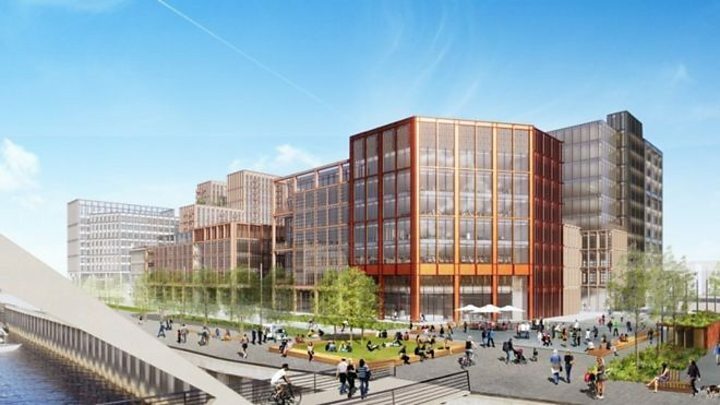 She added: "The new campus will strengthen Glasgow's financial services sector and shows Scotland continues to be a highly attractive location for inward investment. "I am particularly pleased that as part of this investment, Barclays has committed to employing local people who often face barriers into work, including those with disabilities and young people." Paul Lewis, from Scottish Enterprise, said: "This investment establishes Glasgow as a key global site for Barclays, providing a platform for growth whilst also securing existing operations in Scotland. "It will breathe new life into a part of the city with huge potential and bring significant new jobs, including employment specifically for disadvantaged workers." Drum managing director Graeme Bone said the project was "setting a new benchmark for large scale development across Scotland"
He added: "Our development will be one of Scotland's largest single-site construction projects, bringing together over a million square feet of prime Grade A office space with residential accommodation, and an exciting mix of amenities and landscaped public spaces." But two words of caution: the numbers are "up to 2,500 jobs". And as some of them are being relocated from London and possibly elsewhere, Glasgow will still have to fight and make its case if that potential number is to be reached.